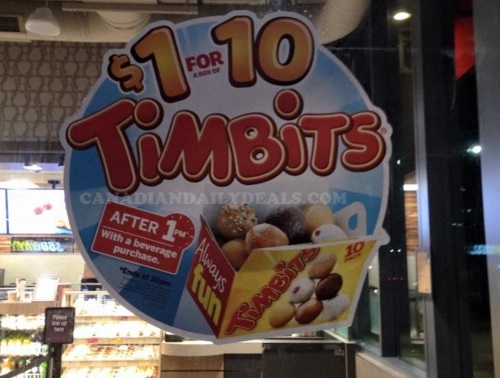 Tim Hortons has a hot new offer! Get a box of 10 Timbits for only $1 after 1pm with a beverage purchase! I took this picture at my local Tim Hortons in Toronto, I didn't see it on their website yet. Remember when a box of 20 Timbits was $2? Now they are $3.99! This offer is valid from 1pm-10pm for a limited time at participating locations. As always, look for signs before ordering, ask the staff if they are doing this promotion, etc. I just post what I find and I can't speak for where this offer is specifically if I am not provided that information. Depends on what your local is, this is in Toronto for sure, that's where I am and where I've noticed the promo.